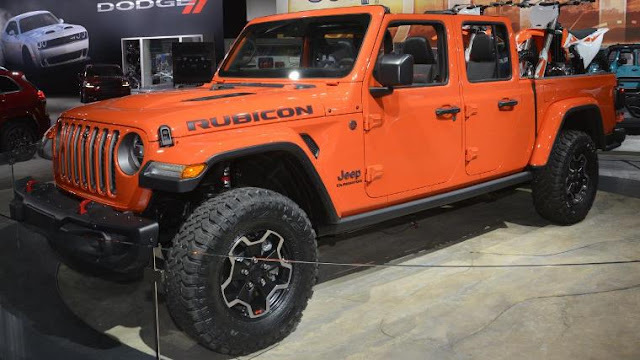 The all-new 2020 Jeep® Gladiator features a five-foot steel bed, is available in Sport, Sport S, Overland and Rubicon trims and is powered by a 285 horsepower 3.6-liter Pentastar V-6 engine at launch with a 3.0-liter EcoDiesel V-6 engine being offered in 2020. A six-speed manual transmission is standard on all Gladiator models equipped with the 3.6-liter Pentastar V-6, and an eight-speed automatic transmission is optional.A 7.0- or an available 8.4-inch touchscreen houses the fourth-generation Uconnect system. The Gladiator has up to 7,650 pounds of towing capacity and up to 1,600 pounds of payload capacity. The Mopar brand will offer more than 200 new or redesigned Jeep Performance Parts and accessories for owners to personalize the all-new 2020 Jeep Gladiator at launch. Built in Toledo, Ohio, the all-new 2020 Jeep Gladiator arrives in showrooms in the second quarter of 2019.